Monterey Bay is the premier destination for whale watching all year! We see whales every day here in Monterey. 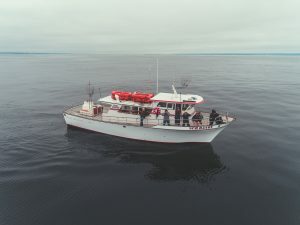 Our daily whale watch trips are narrated by a marine biologist or naturalist who provides educational and interesting information about whales, dolphins, and a wide variety of marine wildlife. In addition to teaching you about the wildlife, our marine biologists and naturalists will provide information about the natural history of the local area and talk about conservation. While out on the ocean, our marine biologists and naturalists are also collecting sighting data for scientific research. We are highly invested in learning about our local wildlife and serving as a data collection resource for other scientists who study our local wildlife as well. We travel to different locations within Monterey Bay National Marine Sanctuary to view whales and dolphins throughout the year. Our crew will show you how to spot whales and dolphins as well as give you advice on how to best capture photos and videos of the wildlife. We regularly send out a professional photographer on our whale watch trips to capture those amazing moments with the wildlife. Therefore, you don’t have to worry about getting the perfect shot if they are on board. We have two “seasons” for our trip offerings when you look at our calendar of availability. The summer/ fall season is from Mid-March through early December. The winter season is from December-mid March. The seasons mostly designate the duration and departure times of our trips. All of our trips are weather permitting. During the summer/fall season we are focusing on feeding whales that come to the bay to feast on small fish and krill. We expect to see humpback whales daily but we can also view blue whales, fin whales, gray whales (finishing migration), killer whales and a variety of other dolphin species. The summer / fall season can be very windy in the afternoon! The wind pattern we get from spring to mid-summer is great for the ocean, but can make it difficult for a boat ride. Please consider this when you choosing between your options. We offer a morning tour (recommended) at 9am which is 3.5-4 hours in duration. We also offer an afternoon tour at 1:30pm which is 2.5-3 hours in duration. Whale sightings are consistent all day, but the morning sea conditions are usually more favorable. We like to take extra time searching a variety of areas around Monterey Bay in the morning, while the seas are calmer so that we can make our best route plan for the afternoon when the seas can be more choppy. During the winter season we are focusing on migrating whales. The one of largest movement of mammals on earth happens just off the coast of Pacific Grove, CA – the south end of Monterey Bay. Gray whales pass by the coast, about a 30 min ride from Monterey Harbor. Due to the short distance from the “gray whale super highway” our trips can be shorter in duration for the winter time. We depart at 10am and 1:30pm daily during this time of year. When sea conditions become too rough to be able to go out we try to offer an alternate tour for our guests. You may get a phone call with an offer for a nature tour if our schedule and sea conditions allow for it. This hour-long cruise is perfect for people interested in a scenic tour near Monterey Harbor. We will observe hundreds of California Sea Lions, Harbor Seals, Southern Sea Otters and a variety of birds! We will also explore the vast kelp forest along the shoreline. The trips are narrated by one of our naturalists or marine biologists. We will teach you about the wildlife near shore in Monterey Bay, the natural history of the area, and answer any questions you have. This is an excellent coastal tour for photographers with nice views of the Monterey Harbor, Fisherman’s Wharf and Historic Cannery Row. 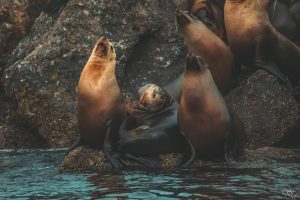 We will take a tour outside of the harbor and view the historic buildings of Cannery Row, the Monterey Bay Aquarium and Hopkins Marine Station. This trip is great for families! The trip length is perfect for young children who may be riding on a boat for the first time. It is also an excellent “warm-up” trip to test your sea legs before coming on a longer whale watching trip here in Monterey Bay. As time goes on we may offer this regularly on our schedule. Scattering a loved one’s ashes at sea is a beautiful way to say goodbye. We offer one hour charters along the Pacific Grove coast to scatter ashes at sea. We like to stop along the coast near Lover’s Point so that the location of the scattering can be easily viewed later for you and your friends and family. We can also travel to other nearby locations. If you are considering a specific location, please express that to our staff when making your reservation. You are welcome to bring flowers or other plant material to put in the water with the ashes, as part of your send off. We also encourage the use of biodegradable urns, which can be entirely placed in the water. We are licensed by the State of California Cemetery and Funeral Bureau as a Cremated Remains Disposer to scatter ashes at sea. You are also required to obtain a permit for the ashes before we can take you to have them scattered at sea. You can obtain this permit at the Monterey County Health Department located at 1270 Natividad Road, Salinas CA 93906, or you can request that the permit you receive with the ashes from the crematorium states “for scatter at sea off the coast of Monterey”. After the scattering is performed, we will provide you with a certificate for you with the GPS coordinates of the scattering location for your memories and for your records. Looking for a special trip for your group? We offer private charters for scenic tours, whale watches and more! Come and join us for a private trip, a corporate event, a special occasion, family gathering. We are happy to accommodate a wide variety of requests. So please don’t hesitate to ask our staff about options for your trip. While we are the newest whale watching company in Monterey, we bring together a very experienced and educated crew from all over the west coast. Many of our crew members have worked in the Monterey whale watching industry for years. Monterey Harbor is located in a weather protected location of the southern end of Monterey Bay. It is a perfect starting point to reach any part of the bay during a 3.5-4 hour tour. We are also able to search for wildlife along the Pacific Grove coast and south into Carmel Bay. These southern areas are often feeding grounds for whales, dolphins, and seabirds. Therefore, tours leaving from the Monterey Harbor are able to access to more areas to find whales and other wildlife. Our crew is committed to participating in research while whale watching, and we would like for you to be a part of it! You will have the opportunity to learn how to take and submit a photo for humpback whale research, if you choose to do so during your trip. 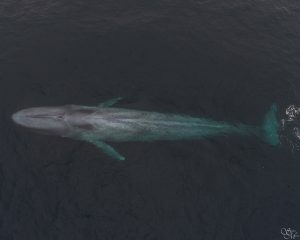 Check out the citizen science based group we submit data to: Happywhale. Safety is our number one priority out at sea. We provide life jackets to all children 6 years and younger or who weigh 60 pounds or less. We are inspected annually by the U.S. Coast Guard. And all of our vessels go through regular maintenance and are U.S. Coast Guard certified. What scientists know about marine mammals is constantly changing and evolving. Not only does our crew of naturalists participate in research while on our vessels, they are also dedicated to staying current on the latest publications about our local wildlife. They are committed to communicating the most current information to all our guests in a way that is accessible to everyone. We are happy to accommodate guests of any age. Our only passenger restriction is no pregnant women. (Congrats!) Please join us after the baby is born. For those with limited mobility, we do have a staircase with about 13 steps to get down to the boarding area that may prove too difficult to navigate for some guests. The step across to the boat can also be mis-matched depending on the tide. We do use steps to make the step across to the vessel as level as possible. 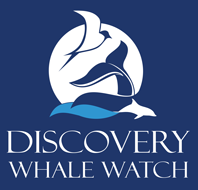 In order to best serve our guests, Discovery Whale Watch is always striving to stay on the leading edge of technologies for the industry. This includes the equipment on our vessels, our web resources and technologies, and the services that we offer to our guests.